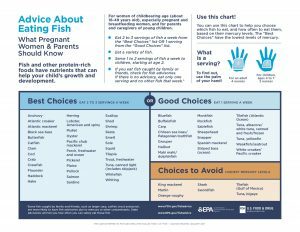 If you’re an expectant mom trying to diversify your diet and to eat healthier this summer, two federal agencies are offering evidence-based advice about seafood dining: Use a little caution with servings of certain fish like king mackerel, marlin, shark, swordfish, and bigeye tuna that tend to carry higher levels of problematic mercury. 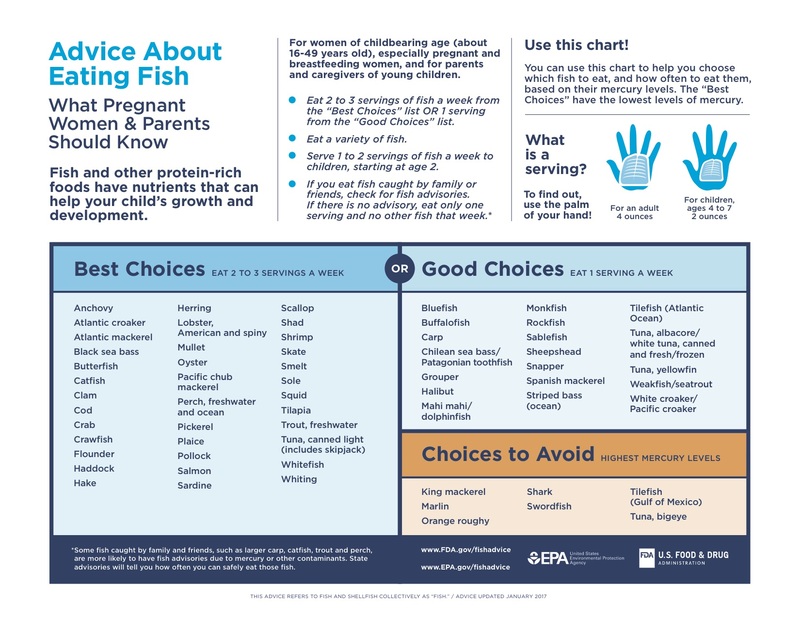 The federal Food and Drug Administration and Environmental Protection Agency have teamed up to revise their safe fish guidelines and to offer these in a handy guide to not only pregnant women but to all parents really. The FDA and EPA have examined the risks and benefits of 62 species, dividing them into three categories (best choices, good choices, and choices to avoid) and finding that most Americans eat most of their fish from the first selection, which includes salmon, canned tuna, crab, scallops, and U.S. spiny lobsters. If they must, youngsters and moms shouldn’t take in more than one serving per week of fish from the “choices to avoid” to minimize their mercury risks, the EPA and FDA recommend. Although it has joined with its sister agency on updating the 2014 fish guidelines, the FDA, it is worth noting, has decided to give the food industry more time to add and refine dietary information provided on package labels. President Trump ordered the delay in what many political analysts saw as a swipe at the healthy food initiatives of former First Lady Michelle Obama. Consumer advocates long have pushed for greater disclosure of this data, arguing it may help Americans cut down on unhealthy and excess calories, sugar, and salt in their diets. Some companies, notably the maker of Campbell soups, have decided it doesn’t make sense to put off the label changes, for which many consumers have clamored. In my practice, I see the harms that patients suffer while seeking medical services, including due to diseases and conditions tied to bad diet and obesity. More than a third of Americans are obese, and the medical costs of excess weight, including in the care for heart disease, diabetes, stroke, and some cancers, amount to almost $150 billion annually. Losing weight is tough, even in carefully controlled situations. Americans struggle to reject the persistent, pervasive campaigns by Big Sugar and others to get us to eat badly. But moderation and common sense can be good guides to eating more healthfully and exercising beneficially. Clear, accurate, and accessible nutritional information about our foods also can be useful and helpful. Giving it out doesn’t create a nanny state, and agencies and companies that do so deserve support.